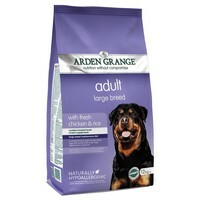 Arden Grange Large Breed Adult Dog Food (Chicken & Rice) has been specially formulated for large and giant breed dogs with normal activity levels. Made with a combination of fresh chicken and high quality chicken meat meal to provide a protein of very high biological value, this delicious Arden Grange recipe also contains increased levels of glucosamine, chondroitin and MSM to help support larger dogs in maintaining strong joints and healthy cartilage. Arden Grange Large Breed has also been made with a large kibble size, which is perfect for large and giant breeds, as well as smaller brachycephalic breeds such as the bulldog. we have 2 working labs, aged 4 and 1 years both dogs have been on Arden Grange since puppies. Its a great food with no junk. We did try james well beloved but found our older lab lost a lot of weight through being an active dog and the food not having enough calories in it. Our youngest hasn't had a problem with Arden Grange and after all if we eat good home cooked food sourced locally why should our dogs eat rubbish!! I can't recommend this brand highly enough. My Labrador puppy initially struggled as a youngster on another popular brand of food and constantly suffered a poorly stomach. Since changing onto large breed puppy and then later on to the large breed adult, he's been a different dog. He has developed really well, with a shiny, glossy coat, healthy teeth and skin. I've even put my older dog onto it and they both love it. Its good value for money (particularly from VetUK!) and has similar ingredients to much more expensive brands. I like the fact that it also contains no hidden nasty additives and they have clearly labelled packaging so you know exactly what you are feeding your dogs. Their helpline is excellent and they really know their stuff. Top Marks!